My parents are Russian, a mother is from Kluge and a father is from Vologda. My culture is Russian too in spite of being born in Minsk. My attitude to Russian was always with light irony. It was like a parody into Russian language. Ukrainian and at the same level Polish were parodies for me. I left the prestigious department of journalism of the Belarusian State University in 70s because of big doses of “radnoy movy”. It was not an only reason. I tried to enter the VGIK for four times. It was with changeable success. And at the fifth time I tried to enter the LGITMIK though the last time I did not take the entrance exams and took the documents .Than I lived in a tiny room with Zaitscev Gena , the President of Leningrad Rock-Club. There I had heard the works of Morozov Yuri whom I had met in 20 years. If somebody asks me about the close thing in music and what I absorb so I may answer in brief, BBM. That is the Beatles, Bach, and Morozov. All other types of music are subordinate for me. Bach lived many years ago as for both of the Beatles I am not sure I will be able to see them, but as for Yuri Morozov I could have met and the meeting was amazing and with the numerous consequences. The main of them was a film we began to shoot together. I haven’t graduated the Institute as a journalist but at any case I’ve got a diploma of a historian and I have worked as a film director’s assistant in Belarus film for more than 13 years. From a number of films, the names of the most I have completely forgotten I only remember the film “Go and Look” by Klimova Elma. The others are full nonsense and make me feel nervous. The main of their reason is increasing of the rates of pay and the way of living of a person who works in a film production. I always tried to avoid it. It is because of my preference to listen to Morozov? At the end of perestroika I got to the South-Western part of France. It was a historical Oksitania, a nice town Toulouse. At any rate it lost its charm long time ago. There I had some hard difficulties also. The bright remembrance of the work in the theatre comes into my mind now. It was a real bards’ theatre of an old France. It was the first time when I came out on the stage and gave a speech using Molier’s language. There were exciting movements over the country with a lorry full of the decorations and a bus full of crazy and half -drunken actors. The number of the towns and forests again appear in my mind. It wasn’t Paris, the French were others and France was another. And it was so happened the theatre had been ruined without governmental support. So I became an unemployed. I wanted to come back and thank goodness I hadn’t changed the citizenship. At that moment I realized that it was the time to come back home because I was tired living abroad. It was the most tourist country in the world. At that time the providence gave me two meetings at once. The first, it was a period of trainee as a scriptwriter or a director of a documentary. I have shot 20 minutes film about the father Leonid, he was an immigrant of the first war, he was an ugly man in an oversea country. He was a pianist and a painter and I liked it. It was possible to be a director without professional education but it was necessary to prove your skills. Than there was another film about the church built in Vyatka at the beginning of 90s. This church was carried to France. Its name is “Russian sister from Silvanes’s Abby”. The film was shown on France 3 Channel and WHO. It was also shown in Russia “The World’, “ Kievskaya Russ” . You may buy it in the churches and in the Internet. There was the third film but now I want to tell about the second meeting which was given with the providence. I met the idol of my hippy youth with Yuri Morozov. But at that moment I felt that my life route had been crossed by common but a great man. I communicated with him not only as a fan of rock. We had an idea to shoot a film about him. The idea appeared because of his video clips full of originality, imagination. I could feel it while I was listening to the cassette him to have been presented to me. Than there were many trips to Saint- Petersburg. Every time I stayed at the Morozovs . That’s why I had my draught interviews with him. I am so sorry but, all these interviews were put into the main idea of the film. I have spent for three years before I could find money and rewrite the scriptwriting and rerecording. The film may be called as approved by the author, the main character, “In general, everything is right.” In a such way this film was appreciated by a musician, a Romanist, a poet but also by a man who could not bear with lie. Due to these interviews the effect of full presence of Yuri Morozov is in the film but only at the end of the film the views understand that he has already died. I do not know about the future chances and it is difficult to judge about my film, but I like it and I like to rewatch both versions as for our so for foreign viewers. Who knows may be I’ ll make the third version. May be I’ll shoot the feature film. 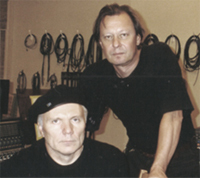 The basis of the film will be the works by Yuri Morozov and his music.